In Curaçao, the climate is tropical, hot all year round, with daytime temperatures ranging from around 28/29 degrees Celsius (82/84 °F) between December and February to around 31 °C (88 °F) between May and October. The period from May to October is the most sultry, but the trade winds blow constantly, tempering the heat. 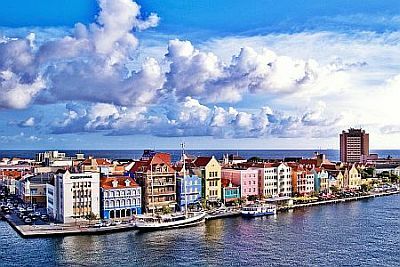 Curaçao is an island, and like the neighbouring islands of Bonaire and Aruba, it's part of the Kingdom of the Netherlands. Here are the average temperatures of the capital, Willemstad. The climate is sunny and dry, in fact, about 550 millimeters (21.6 inches) of rain fall per year. The only relatively rainy period is from October to December, when, however, precipitation does not go beyond 80/100 mm (3.1/4 in) per month. From November to January or mid-February, the northeast trade winds bring showers quite frequently, although usually not abundant. Curaçao is an almost entirely flat island: its highest point is located at 375 meters (1,200 feet) above sea level. The amount of sunshine is good all year round, as can be seen in the following table. The sea in Curaçao is warm enough to swim in throughout the year: the water temperature reaches a low of 26 °C (79 °F) in February and March, and a high of 29 °C (84 °F) in September and October. Here are the average sea temperatures. From June to November, but especially from August to October, there is the danger of tropical storms and hurricanes, which, however, are rare in Curaçao and the Leeward Antilles because of their southern location. However, sometimes hurricanes can also reach this island, as happened with Hurricane Irene in September 1971, Joan in October 1988, Bret (tropical storm) in August 1993, Ivan in September 2004, and Felix in September 2007. The best time to visit Curaçao runs from mid-February to May. The period from October to December (and sometimes even January and the first half of February) is quite rainy. All year round: bring light, loose-fitting clothes, and possibly a light raincoat for thunderstorms, especially from October to January. Those who are sensitive to cold can bring a light sweatshirt for the evening.